This wallpaper shows a view of New York harbor as seen from Castle Williams on Governor's Island. The design features a landscape view that alternates with an eagle bearing an E Pluribus Unum banner. The paper is woodblock-printed in grisaille or shades of gray with a green filigree running through the design that outlines and connects the different elements. The foreground of the landscape view shows a sentry walking around the base of Castle Williams, a nearly circular fort built between 1807-11. Castle Williams was considered to be a state-of-the-art fortification and remained influential in fortress design for decades to come, so it makes sense to include this structure in a patriotic wallpaper. A variety of large and small vessels sail the harbor including paddlewheel boats and tall ships. The Manhattan skyline can be seen in the distance. This print of the eagle is based on the Great Seal of the United States, whose eagle clutches a banner in its beak, carries thirteen arrows and an olive branch in its talons, with thirteen stars overhead, each of which symbolize the original thirteen states. Twenty stars appear over this eagle’s head, and if symbolic in this use, could date the paper at 1817 when Mississippi became the twentieth state. Landscape views appearing on wallpaper designs were frequently copied or inspired by period prints. There was a note on this object’s catalog record stating that was most likely the case with this wallpaper. Knowing some of the key elements of this scene I went onto the Museum of the City of New York’s website and found a very similar view of New York harbor as viewed from Governor’s Island dating to 1820. 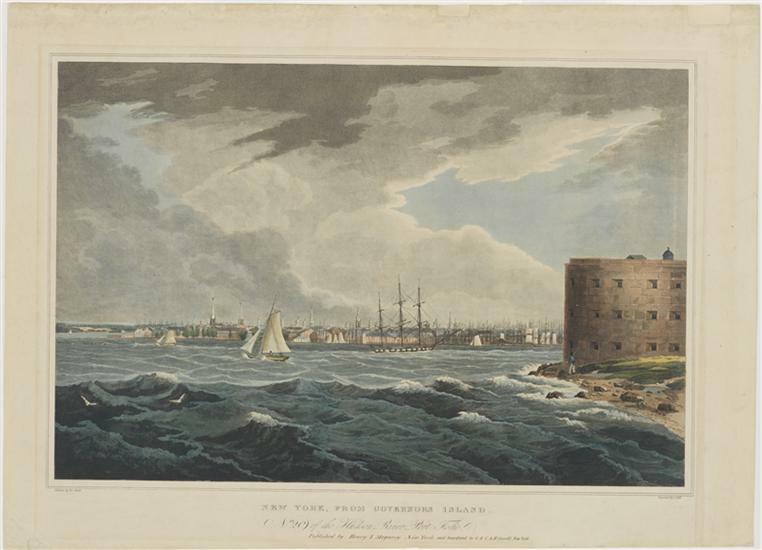 The sentry walks around the fort, ships are sailing in the harbor, Manhattan can be seen in the distance, and the rolling waves in the print have been replaced by barrels and other items on shore.